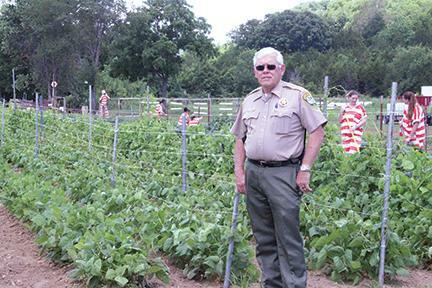 One of the best-kept gardens in Cannon County is located outside the Cannon County jail. Like most gardens, this one yields a large amount of product that proves savory during this time of year. What makes this garden unique is it is manned by jail inmates and saves Cannon County taxpayers roughly $25-to-$30,000 annually, according to Sheriff Darrell Young. The concept of the jail garden was developed four years ago when Young was elected sheriff; however, he doesn’t take full credit for the brainchild. Young said he contacted Tennessee Corrections Institute (TCI) to determine the possibility of having a garden in order to grow food the inmates to eat. Young estimates the garden has saved Cannon County more than $100,000 during his tenure as sheriff. It has also created work ethic and pride amongst the inmates that work it. The large garden contains potatoes, cabbage, onions, and tomatoes, different types of beans, black-eyes peas, October beans, purple hull peas, squash, cucumbers, watermelon and cantaloupe. When Young became sheriff there was one cooler at the jail and there are now six. Five of those were donated. Carpenter says getting to work in the garden is a privilege that is not taken lightly. Much of the seeds and such are donated by business. What isn’t donated is purchased out of pocket by Young and his wife, Rachel, including seeds for produce and freezer bags, among other necessities needed to grow a productive garden. Inmate Amber Fleming said there is something about sitting down to a meal and eating food you helped grow. Inmate Toni Jo Cunningham also understands the concept of the bottom dollar. Young said some former prisoners have informed him of starting their own garden upon getting released. Young is proud of the garden at the County jail and he’s pleased with the work ethic it has created within the jail population. He is even more satisfied with the money it has saved Cannon County taxpayers during the last four years.